Synopsis: A wave of delight and anticipation sweeps through a small community of red squirrels as they behold a vast fleet of boats carrying their distant cousins towards them. They will no doubt bring incredible wealth, wisdom and joy to the humble squirrels of Nutshaven. With their entire way of life now under threat, will the wisdom of old Normsk, the wits of young Cheswick and the might of Brutenuts the Brave be enough to counter such a dark and dominant force? A number of reviews have commented on how Wedlake and Mounter’s novel presents vibes similar to Jacques’ Redwall and Adams’ Watership Down. It’s been a long while since I’ve read Adams’ novel and I’ve only ever watched the television series adaptation of Redwall but I have to say, I very much agree with this statement. A heavily story focused novella, this both children’s and YA novel is complex in it’s themes and relation to the world around us today. CONTENT & TRIGGER WARNING: This book contains abuse, death, loss of a loved one (mentioned), slavery, torture (minor), trauma, and violence. Encompassing a multitude of heavy themes, this novella addresses a large number of political and social injustices that should not be ignored. Similar to George Orwell’s Animal Farm, this novella is referenced as a “children’s novel” when it truly is much more than that. On a surface level, this novel still discusses some sensitive issues — slavery, torture, captivity and brainwashing to name a few. But on a deeper level, this story is so much more than this. There’s a centralization on the devastation of dictatorships, illustrating the harsh reality of those who live under such government regimes. The story also reflects much of the horrors and brutality many experienced during the uprising of Nazism, such as segregation and concentration camps. Other elements seen in this novel include concepts of colonialism, racism and discrimination, war, and much more. Very imagery heavy, this novella makes it easy to visualize the plot. Anyone that may have a harder time when it comes to visualizing the contents and scenes in a novel should have no difficulty with this one. Mounter and Wedlake provide the PERFECT amount of imagery, allowing the reader to effortlessly view the events unfold as though it were a movie rather than a novel. Not too much, but not too little — really well done in this department! For those who are plot driven and descriptive heavy lovers, this novella may be for you. Mounter and Wedlake’s novella focuses HEAVILY upon the story, pushing the plot forward above other elements. The plot itself is incredibly intriguing, making this a wise choice on the authors’ decision when writing. Coinciding with this is a great wealth of descriptive writing, as Wedlake and Mounter center on depicting the events, situations, and location in a highly detailed nature. Too much focus on the villain and not enough on the heroes. Shadowtail, the main villain who leads the grey squirrels, is a fascinating character to read about. He’s vicious, intelligent, and will do anything not to lose. But the problem I had is that the ENTIRE novel seems to be centered around him. The synopsis makes it appear as though the story will center around Normsk, Cheswick and Brutenuts … but it really doesn’t. Though they seem interesting, the appearance of these three heroes is disappointingly minimal. The story is both not long enough and jumps around between scenes too much, creating this feeling of missing information. Being less than 100 pages, I thought that there may still be a way for the story to feel complete … but it didn’t. The plot’s concept is INCREDIBLE and could’ve easily been an over 300+ page novel — this is where the novel faltered for me, for there’s so much more that could’ve been added but wasn’t. This is also where the “jumping” between scenes and chapters lies, making one wonder what happened between the chapter; there just isn’t enough content in the approximately 100 pages. If this was a greater length and with added content, The Ghost of Crow Cavern would’ve been absolutely riveting. This novel lacks dialogue to a fault, making it somewhat boring at times. I’m all for narrative writing styles, where there’s plenty of descriptive sections and writing on the characters’ internal thoughts … but this was just too much. For me, dialogue is how we learn more about a character’s personality and their past … through discussion. A book should be fairly equal parts dialogue and narrative, but the narrative overtook this one. There’s little to no character development, making the characters flat. It took me a bit to remember the characters’ names, since there wasn’t much growth among any of them to really get to know them and, hence, remember them. The story basically mentions them and goes minimally into their pasts, which was frustrating as I REALLY wanted to get to know them more. Character oriented readers may be somewhat disappointed. Mounter and Wedlake’s The Ghost of Crow Cavern is a grand story oriented novella, discussing a number of political and societal issues in the midst of all the adventure. Though the story felt incomplete and the character growth could use some work, the plot is still intriguing and the insights into how this novella connects to real world issues past and present is phenomenal. This is a great example of literature that could be used in the classroom, due to it’s connections with real world scenarios. 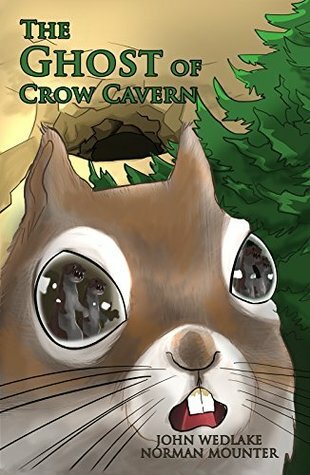 For you story oriented and plot driven readers, The Ghost of Crow Cavern may be the next great read for you.